Moitie is a brand that I definitely have a love/hate relationship with. Sometimes they completely blow me out of the water with designs that I find incredibly unique and cool, other times they release stuff that I find so boring that I begin to suspect that the whole brand is just an elaborate joke set up by Mana. I can imagine Mana in his mountain-top gothic castle cackling over designs for a pair of plain black pants, tie-dye shirts that look like they were designed for trendy grandmas, and plain black turtlenecks. Their recent design was definitely something that really reminded me of my love/hate relationship with the brand. At first, upon seeing the design picture I thought "Oh wow! That is a really cool looking design! The writing in the background is so cool, and I like all the different images!" Then seeing it on an actual dress made me change my mind completely. What might make a cool border image turns into an awkward print on a ho-hum dress design. 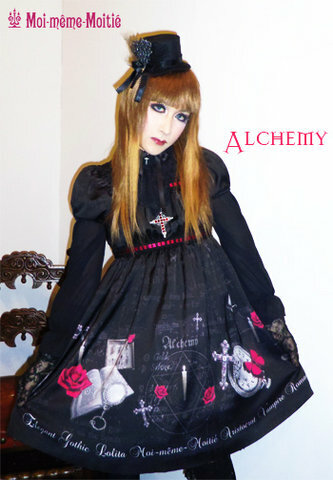 Moitie is famous for making simple yet striking designs, and Gothic minimalism seems to be their motto, but, to me, the minimalist dress design, plus a giant cluttered print just looks like Angelic Pretty gone Goth. Which might be a neat thing, but I just find it really awkward coming from Moitie. I think it's almost like they're trying to jump on the OTT trend a year too late. 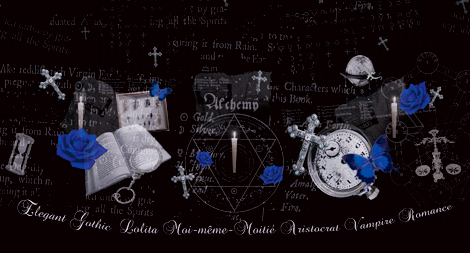 I would love to see an alchemy themed print from Moitie, with magic circles, alchemical symbols, and I'd even be cool with some crosses and roses thrown in, but I can't help but wish they used this idea for one of their more classic screen printed designs. 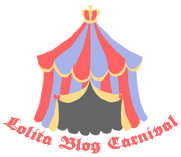 I think that this way it would have definitely been undeniably Moitie and not so much Moitie does Angelic Pretty. I'd love to see an achemy print in the traditional moitie style, it should look like extracts diagrams and extracts from a book not that. We need to have an intervention to remove mana from photoshop. Heh, as a practicing witch, I can guarantee you there's nothing like that in my little book. ^_^ And I really do despise the whole stereotype of all goths being witches or satanists, even though I am a witch, lol. The merkaba or "star of david" as it's known is a common figure in sacred geometry that occurs in many cultures such as Hinduism and does indeed have a place in alchemy.